A belt is a looped strip of flexible material, used to mechanically link two or more rotating shafts. They may be used to move objects, to efficiently transmit mechanical power, or to track relative movement. Belts are looped over pulleys. In a two-pulley system, the belt may either drive the pulleys in the same direction, or the belt may be crossed so that the shafts move in opposite directions. A conveyor belt is built to continually carry a load between two points. Belts are the cheapest utility for power transmission between shafts that may not be parallel. Power transmission is achieved by specially designed belts and pulleys. The demands on a belt drive transmission system are large and this has led to many variations on the theme. Belts run smoothly and with little noise, and cushion motor and bearings against load changes, albeit with less strength than gears or chains. However, improvements in belt engineering allow use of belts in systems that formerly allowed only chains or gears. 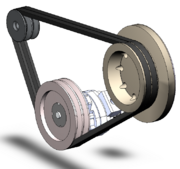 A belt drive is simple, inexpensive, and does not require parallel shafts. It helps protect a car from overload and jam, damping it from noise and vibration. Load fluctuations are shock-absorbed (cushioned). They need no lubrication and only little maintenance. They have high efficiency (90-98 percent), higher tolerance of misalignment, and are relatively inexpensive. Clutch action is activated by releasing belt tension. Different speeds can be obtained by step or tapered pulleys. However, the angular-velocity ratio is not constant or equal to that of the pulley diameters, due to slip and stretch. Heat accumulation is present, and speed is limited to approximately 7000 feet per minute (ft/min), and a power of only 500 horsepower (hp). Temperatures ranges from -31 to 185°F. Adjustment of center distance or addition of an idler pulley is crucial for balancing the wear and stretch. To install endless belts, the relevant assembly must be dismantled first. Flat belts were used early in line shafting to transmit power in factories. It is a simple system of power transmission that was well suited to its time in history. It delivered high power for high speeds (500 hp for 10,000 ft/min), in cases of wide belts and large pulleys. However, these drives are bulky, requiring high tension leading to high loads, so vee belts have mainly replaced the flat-belts (except when high speed is needed over power). The Industrial Revolution soon demanded more from the system, as flat belt pulleys need to be carefully aligned to prevent the belt from slipping off. Because flat belts tend to slip towards the higher side of the pulley, pulleys were made with a slightly convex face (rather than flat) to keep the belts centered. The flat belt also tends to slip on the pulley face when heavy loads are applied. In practice, such belts were often given a half-twist before joining the ends (forming a Möbius strip), so that wear was evenly distributed on both sides of the belt (DB). 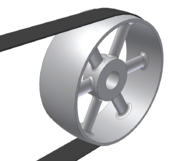 A good modern use for a flat belt is with smaller pulleys and large central distances. They can connect inside and outside pulleys, and can come in both endless and jointed construction. Round belts are a circular cross section belt designed to run in a pulley with a circular (or near circular) groove. They are for use in low torque situations and may be purchased in various lengths or cut to length and joined, either by a staple, gluing or welding (in the case of polyurethane). Early sewing machines utilized a leather belt, joined either by a metal staple or glued, to great effect. The Vee belt (also known as V-belt or wedge rope) provided an early solution to the slippage and alignment problem. It is now the basic belt for power for the transmission. It provides the best array of traction, speed of movement, load of the bearings, and longer service life. It was developed in 1917 by John Gates of the Gates Rubber Company. They are generally endless, and their general cross-section shape is trapezoidal. The "V" shape of the belt tracks in a mating groove in the pulley (or sheave), with the result that the belt cannot slip off. The belt also tends to wedge into the groove as the load increases—the greater the load, the greater the wedging action—improving torque transmission and making the vee belt an effective solution, needing less width and tension than flat belts. V-belts trump flat belts with their small center distances and high reduction ratios. The preferred center distance is larger than the largest pulley diameter but less than three times the sum of both pulleys. Optimal speed range is 1000-7000 ft/min. V-belts need larger pulleys for their larger thickness than flat belts. They can be supplied at various fixed lengths or as a segmented section, where the segments are linked (spliced) to form a belt of the required length. For high-power requirements, two or more vee belts can be joined side-by-side in an arrangement called a multi-V, running on matching multi-groove sheaves. The strength of these belts is obtained by reinforcements with fibers like steel, polyester or aramid (e.g. Twaron). This is known as a multiple-belt drive. When endless belts do not fit the need, jointed and link vee-belts may be used. They are, however, weaker and speed up to only 4000 ft/min. A link v-belt is a number of rubberized fabric links held together by metal fasteners. They are length adjustable by dissasembling and removing links when needed. Though often grouped with flat belts, they are actually a different kind. They consist of a very thin belt (0.5-15 millimeters or 100-4000 microns) strip of plastic and occasionally rubber. They are generally intended for low-power (ten hp or seven kW), high-speed uses, allowing high efficiency (up to 98 percent) and long life. These are seen in business machines, tape recorders, and other light-duty operations. Timing belts, (also known as Toothed, Notch or Cog) belts are a positive transfer belt and can track relative movement. These belts have teeth that fit into a matching toothed pulley. When correctly tensioned, they have no slippage, run at constant speed, and are often used to transfer direct motion for indexing or timing purposes (hence their name). They are often used in lieu of chains or gears, so there is less noise and a lubrication bath is not necessary. Camshafts of automobiles, miniature timing systems, and stepper motors often utilize these belts. Timing belts need the least tension of all belts, and are among the most efficient. They can bear up to 200 hp (150 kW) at speeds of 16,000 ft/min, and there is no limit on speed. Timing belts with a helical offset tooth design are available. The helical offset tooth design forms a chevron pattern and causes the teeth to engage progressively. The chevron pattern design is self-aligning. The chevron pattern design does not make the noise that some timing belts make at idiosyncratic speeds, and is more efficient at transferring power (up to 98 percent). Disadvantages include high starting price, grooving the pulleys, less protection from overload and jam, no clutch action, and backlash. "T belts" that simulate rolling roads for wind tunnels can be made to reach speeds of up to 250 km/h. The open belt drive has parallel shafts rotating in the same direction, whereas the cross-belt drive also bears parallel shafts but rotate in opposite direction. The former is far more common, and the latter not appropriate for timing and standard V-belts, because the pulleys contact both the both inner and outer belt surfaces. Nonparallel shafts can be connected if the belt's center line is aligned with the center plane of the pulley. Industrial belts are usually reinforced rubber but sometimes leather types, non-leather non-reinforced belts, can only be used in light applications. The pitch line is the line between the inner and outer surfaces that is neither subject to tension (like the outer surface) nor compression (like the inner). It is midway through the surfaces in film and flat belts and dependent on cross-sectional shape and size in timing and V-belts. Calculating pitch diameter is an engineering task and is beyond the scope of this article. The angular speed is inversely proportional to size, so the larger the one wheel, the less angular velocity, and vice versa. Actual pulley speeds tend to be 0.5–1 percent less than generally calculated because of belt slip and stretch. In timing belts, the inverse ratio teeth of the belt contributes to the exact measurement. Belt drives are built under the following required conditions: speeds of and power transmitted between drive and driven unit; suitable distance between shafts; and appropriate operating conditions. Factors of horsepower adjustment include speed ratio; shaft distance (long or short); type of drive unit (electric motor, internal combustion engine); service environment (oily, wet, dusty); driven unit loads (jerky, shock, reversed); and pulley-belt arrangement (open, crossed, turned). These are found in engineering handbooks and manufacturer's literature. When corrected, the horsepower is compared to rated horsepowers of the standard belt cross sections at particular belt speeds to find a number of arrays that will perform best. Now the pulley diameters are chosen. It is generally either large diameters or large cross sections that are chosen, since, as stated earlier, larger belts transmit this same power at low belt speeds as smaller belts do at high speeds. To keep the driving part at its smallest, minimum-diameter pulleys are desired. Minimum pulley diameters are limited by the elongation of the belt's outer fibers as the belt wraps around the pulleys. Small pulleys increase this elongation, greatly reducing belt life. Minimum pulley diameters are often listed with each cross section and speed, or listed separately by belt cross section. After the cheapest diameters and belt section are chosen, the belt length is computed. If endless belts are used, the desired shaft spacing may need adjusting to accommodate standard length belts. It is often more economical to use two or more juxtaposed V-belts, rather than one larger belt. Power transmission is a function of belt tension. However, also increasing with tension is stress (load) on the belt and bearings. The ideal belt is that of the lowest tension which does not slip in high loads. Belt tensions should also be adjusted to belt type, size, speed, and pulley diameters. Belt tension is determined by measuring the force to deflect the belt a given distance per inch of pulley. Timing belts need only adequate tension to keep the belt in contact with the pulley. To fully specify a belt, the material, length, and cross-section size and shape are required. Timing belts, in addition, require that the size of the teeth be given. The length of the belt is the sum of the central length of the system on both sides, half the circumference of both pulleys, and the square of the sum (if crossed) or the difference (if open) of the radii. Thus, when dividing by the central distance, it can be visualized as the central distance multiplied by the height that gives the same squared value of the radius difference on, of course, both sides. When adding to the length of either side, the length of the belt increases, in a similar manner to the Pythagorean Theorem. One important concept to remember is that as D1 gets closer to D2 there is less of a distance (and therefore less addition of length) until its approaches zero. On the other hand, in a crossed belt drive the sum rather than the difference of radii is the basis for computation for length. So the wider the small drive increases, the belt length is higher. Otherwise it is similar. ↑ Rhys Jenkins, Links in the History of Engineering and Technology from Tudor Times; The Collected Papers of Rhys Jenkins. Comprising Articles in the Professional and Technical Press Mainly Prior to 1920 and a Catalogue of Other Published Work (Essay Index Reprint Series. Freeport, NY: Books for Libraries Press, 1971, ISBN 0836921674), 34. ↑ Wind Tunnel, New Technology for Ground Effect Simulation Pininfarina Aerodynamic and Aeroacoustic Research Center. Retrieved October 30, 2008. This page was last modified on 8 December 2008, at 18:16.